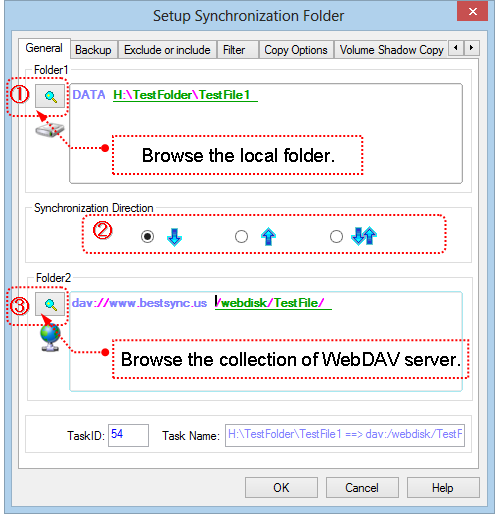 How to setup a task to synchronize with WebDAV collection? 3. 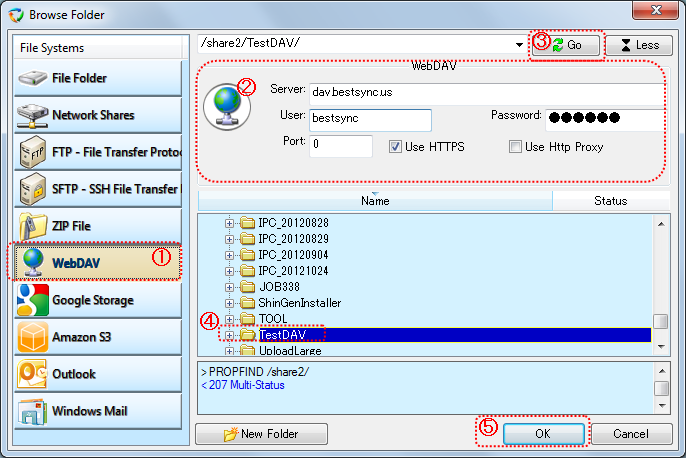 Click to show the "Browse Folder" dialogbox to select the collection of WebDAV Server into the "Folder2" edit box. (1). Select "WebDAV" in the "File System" list. (2). Setup the parameters for connecting to the WebDAV Server server. Server is the hostname or IP address of the WebDav server. User and Password is the login account of the server. Port number can be left empty, BestSync will select the port number by the URL. 80 for HTTP, and 443 for HTTPS. Check "Use HTTPS" if SSL/TLS secured commmunication is required by the server. If you need to set some customized meta data to the file after upload it to WebDAV Server, press "Advanced" button to set the meta values. (3). After setup the connection parameters, press "Go" button to connect to the WebDAV Server, the browser begins to list the folders into the tree view.